Pet owners love to share their food with their furry family members; slipping their pups a taste of the last bit a steak or chicken at dinner is common in most American households. But did you know there are many human foods that have excellent health benefits for dogs? 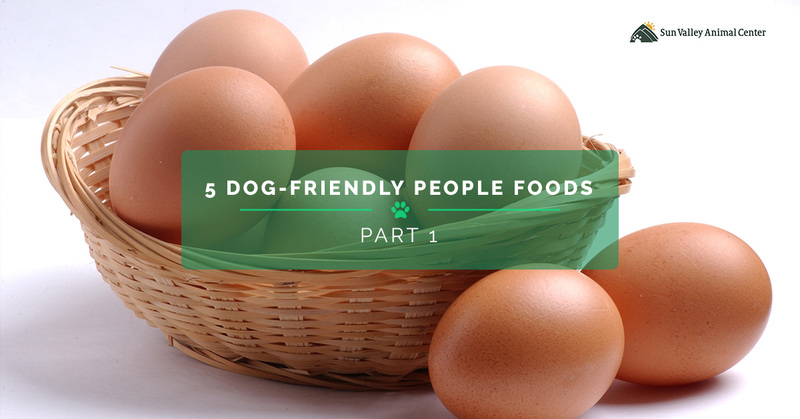 If you’re one of those who is guilty of sharing your dinner with your dog, opting for dog-friendly human foods is a great way to change up their diet from the usual dog kibble. Here are some of the best, most healthful foods to consider if you’re looking to go for a more natural diet, or if you’re simply looking to implement fresh foods into their existing diet. As long as they are fully cooked, hard-boiled eggs are an excellent source of protein for your pup, and can also help calm an upset stomach. You’ll want to feed them eggs sparingly, as eggs are high in fat. Try adding half of a chopped hard boiled egg to their kibble every four days or so for a protein boost. Just remember, dogs are susceptible to salmonella, just like humans, so make sure the eggs are cooked all the way through to avoid catching the disease. Dogs love poultry as much as humans do. While people prefer their turkey to be basted and seasoned, this can lead to toxicity in dogs, which may cause vomiting and diarrhea. If you would like to start feeding your dog turkey dinners, make sure the turkey is free of oil, seasonings, and most importantly, bones. Poultry bones are extremely dangerous for dogs, as they splinter during digestion which may cause tearing and blockage in their digestive tract. Simply add shredded or chopped chicken or turkey to their kibble for added protein. Carrots make excellent treats for dogs. Simply saying the word “carrot” will have them running to the kitchen. Not only is this vegetable tasty for dogs, it is a low-calorie treat that his high in fiber and vitamin-rich. One of the best benefits of feeding your pup carrot treats is that the veggie acts as a toothbrush, gently scrubbing your dog’s teeth with every crunch. If you’re looking for a fiber-rich treat to feed your pup, pumpkin is a great choice. Dogs seem to really enjoy eating pumpkin, whether canned or raw. Pumpkin is also a great source of vitamin A and can help reduce digestive issues. Cheese, in small quantities, is a great treat for your furry friend—as long as your pup isn’t lactose intolerant (a rare condition among dogs). Cheese is a great source of calcium which can help strengthen your dog’s teeth and bones. Most cheeses are high in fat, so if you’re trying to get your overweight dog’s weight under control, pass on giving them cheese treats. However, there are many kinds of cheese that are low-fat, such as mozzarella, cottage cheese, and reduced-fat swiss. Join us next time as we continue looking at human foods that are good to feed your dog. If you’re concerned about your dog’s weight or diet and would like to explore pet wellness and nutrition options, schedule an appointment with our dog nutrition specialists or contact our veterinary hospital today. At Sun Valley Animal Center, your pet’s health and wellness are our main priority.